It’s been three months since we took delivery of our long term test Butcher. We generally aim to have review bikes for about six weeks so we can get a respectable number of rides in, and thus write a relatively informed review with some confidence that what we publish is not complete gibberish. But we’re keenly aware that six weeks is a short period in the lifetime of a mountain bike and that to really get to understand a bike and uncover any potential weaknesses, it can take a lot longer. So we were stoked when Styli from Hyperformance Hardware (the New Zealand Santa Cruz distributor) suggested we do a long term test on one of the new APP bikes. The plan was, and still is, to have the bike for six months, swapping out parts as and when we see fit. This update is possibly a little overdue, but also quite timely as we've only just started making changes to the build. To date we have been running the bike as we originally spec’d it: RockShox 150 mm Revelation fork up front, Hayes Prime brakes, Schwalbe Fat Albert tyres, and a nice wide bar from ABD. The APP bikes (the Butcher and the Nickel) launched last year, are an attempt by Santa Cruz to meld the simplicity and relative affordability of single pivot bikes with the performance of the high end VPP bikes. They’ve done this by introducing a set of linkages to what is otherwise a straightforward single pivot design. These linkages drive the shock, mimicking the leverage ratio of the VPP bikes—a falling rate at the beginning of the travel, followed by a more linear rate mid travel, and then a rising rate in the final stages of travel. This in theory should result in suspension performance that is seemingly more effective across both the little bumps and larger hits, feeling supple and bottomless with little wallow in between. So, does it? The Butcher is no Frankenstein out on the trail. For a 150 mm travel bike it accelerates and climbs with finesse, and also quite admirably tackles the descents. The APP suspension does a great job of keeping you glued to the ground as you fight for traction up steeps, over slippery roots and across awkwardly cambered trails. The secret with any good single pivot bike is pivot placement. Get it wrong and the bike will bob around like an ex-leper under pedalling, or lock up like a federal penitentiary through the rough stuff. Santa Cruz seem to have nailed it with their placement, as the pedal induced bob is negligible and the bike remains active in almost all situations. The exception is under braking. 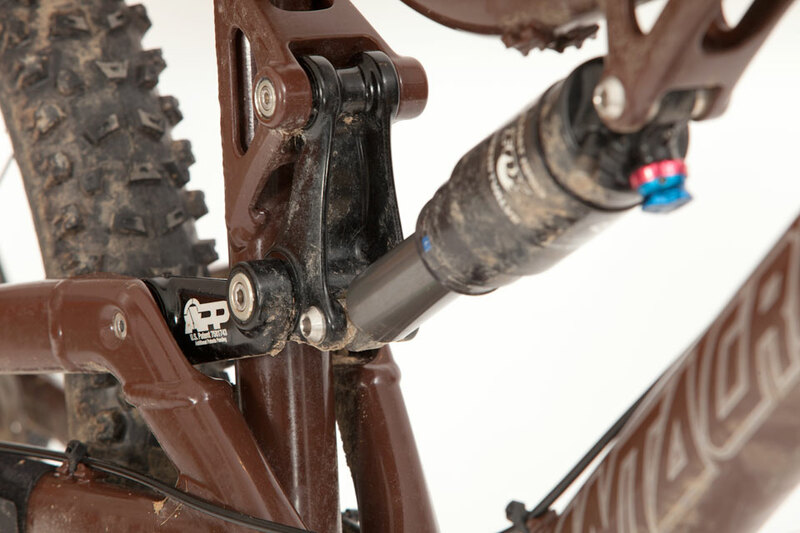 Like almost all single pivot bikes the Butcher suffers from noticeable ‘brake jack’ through fast rough terrain. Is this an issue? Well, it’s certainly not ideal, but personally I tend to treat it as a reminder that I should be braking less often and more strategically. Off the brakes, the back end seems to display all the desirable characteristics of the Butcher’s VPP brethren. But suspension is only a part of the equation in the performance and feel of modern bikes. Equally important is geometry. As I mentioned in my initial post I felt comfortable on the Butcher from day one. All the Butchers angles are pretty spot on (head angle 67.5 degrees, Seat tube 72 degrees). After 3 months of riding the bike I’ve had enough time to get accustomed to it and still feel that I’m not cornering as quickly or descending through steep rough stuff as confidently as I might on some other bikes that I’ve ridden in the past. After inspecting the geometry a little closer I’ve decided that this is probably down to two things. I tend to like bikes with short chain stays and low bottom brackets. With a BB at 13.8 inches the Butcher is sitting marginally higher than I generally like, and the 17.1 inch chain stays are fractionally longer than I’d spec. Of course there are other factors that can contribute to this (riding like a muppet aside) including tyre choice, cockpit setup, and fork setup. The advantage of a long term test is that we can now try changing out some of these variables to see what effect that has on the ride. The plan is to try a slightly longer travel fork (Fox 36), swap out the Schwalbes for some tried and true Maxxis High Rollers, and also tweak the cockpit with a slightly longer stem. In addition we’ll get a few other riders on the bike so we can get a broader range of opinions. Stay tuned . . .